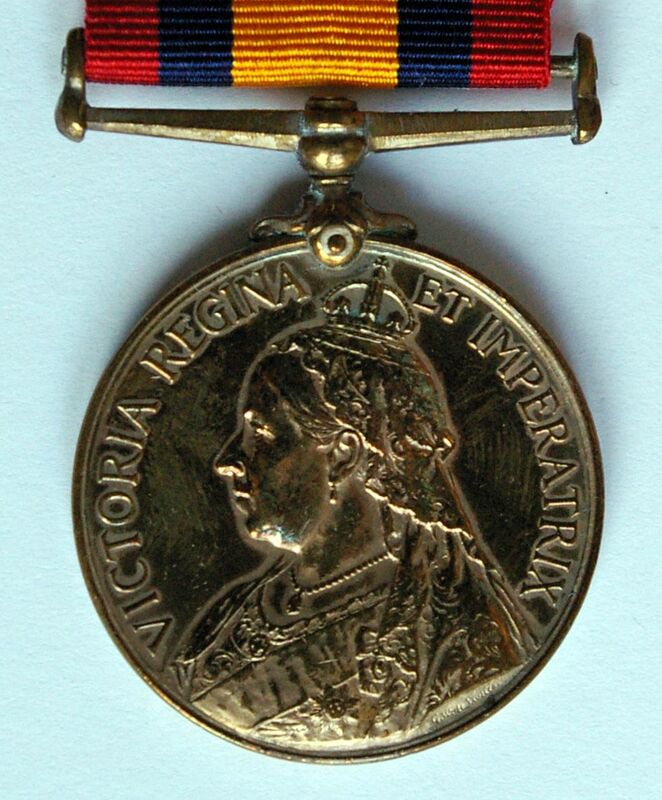 The obverse of this medal has the crowned bust of Queen Victoria with the inscription 'VICTORIA REGINA ET IMPERATRIX'. There were three reverses to the QSA but all three had many similarities. All have the figure of Britannia facing right with her hand stretched out holding a wreath. Behind her is her shield bearing the Union Flag and in the background can be seen the ships of the Royal Navy and soldiers marching into battle. Above Britannia are the words 'SOUTH AFRICA'. The first reverse type contain the raised dates '1899 1900' and is explained here. The second type used to have the dates but these have been removed leaving what are referred to as 'ghost dates' on the reverse and the third type has no dates. 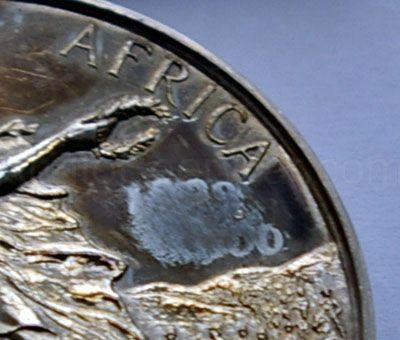 For the first two types, the wreath on the reverse points to the 'R' in the word Africa. For the third type, the wreath points to the letter 'F' in the word Africa. The suspender is straight and attached to the medal via a claw mount. The ribbon is 1.25" wide with a broad central orange stripe and two stripes of dark blue and scarlet on both sides. 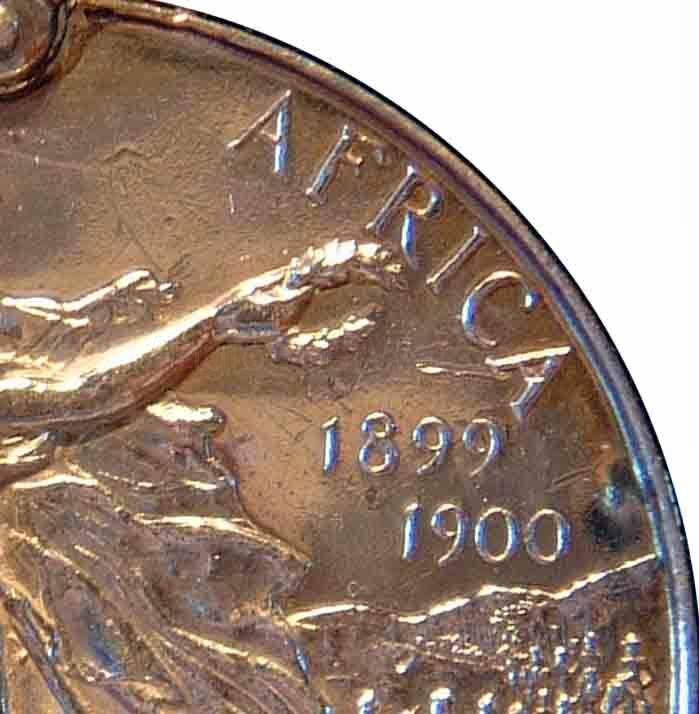 The QSA was mainly issued in silver but in bronze to Indian recipients. The QSA was issued to all British and Colonial soldiers as well as ancillary support staff such as nurses. 1. 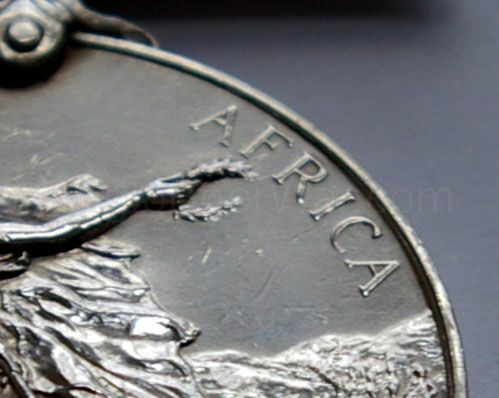 His Majesty, the King, has been graciously pleased to confirm the order given by her late Majesty Queen Victoria that a Medal be struck to commemorate the military operations in South Africa. 2. 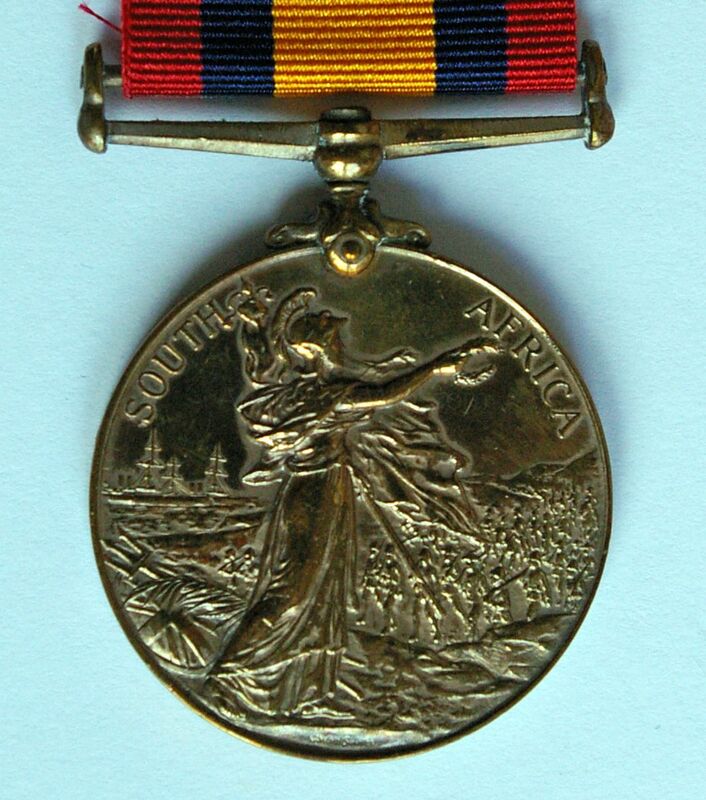 The Medal in silver, will, provided the claims are approved by the Commander-in-Chief, be granted to all officers, warr­ant officers, non-commissioned officers and men of the British, Indian, and Colonial Forces, and to all nurses and nursing sisters who actually served in South Africa between October 11th, 1899 and a date to be hereafter fixed; to all troops station­ed in Cape Colony and Natal at the outbreak of hostilities; and to troops stationed in St Helena between April 14th, 1900, and a date to be hereafter fixed. A clasp inscribed "Belmont" will be granted to all troops under Lieutenant-General Lord Methuen’s command who were north of Witteputs (exclusive), on November 23rd, 1899. A clasp inscribed "Modder River" will be granted to all troops under Lieutenant-General Lord Methuen's command who were north of Honey Nest Kloof (exclusive) and south of Magersfontein ridge (exclusive) on November 28th, 1899. A clasp inscribed "Paardeberg" will be granted to all troops within 7,000 yards of General Cronje's final laager between midnight of February 17th and midnight of February 26th, 1900, and to all troops within 7,000 yards of Koodoe'e Rand Drift between those dates. A clasp inscribed "Driefontein" will be granted to all troops with Army Headquarters and Lieutenant-General French's column i.e. the left and centre columns, which advanced from Poplar Grove on March 10th, 1900. A clasp inscribed “Wepener" will be granted to all troops engaged in the defence of that place between April 9th, 1900 and April 25th, 1900, both days inclusive. A clasp inscribed "Johannesburg" will be granted to all troops who, on May 29th, 1900, were north of an east and west line through Klip River Station (exclusive), and east of a north and south line through Krugersdorp Station (inclusive). 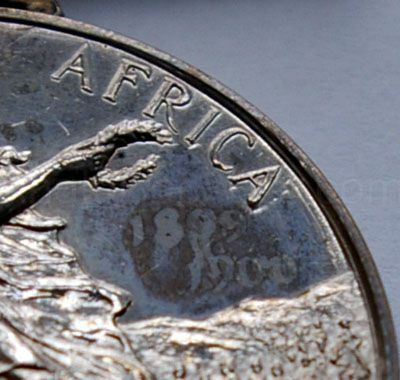 A clasp inscribed "Diamond Hill" will be granted to all troops who, on June 11th or 12th, 1900, were east of a north and south line drawn through Silverton Siding and north of an east and west line through Vlakfontein. A clasp inscribed "Belfast" will be granted to all troops who, on August 26th or 27th 1900, were east of a north and south line drawn through Wonderfontein (the garrison and troops quarter­ed at Wonderfontein on those dates will not receive this clasp) and West of a north and south line through Dalmanutha Station, and north of an east and west line through Dalmanutha Station. This description was subsequently changed to read: A clasp inscribed "Belfast" will be granted to all troops, who, on August, 26th or 27th, 1900, were east of a north and south line drawn through Wonderfontein (the garrison and troops quartered at Wonderfontein on those dates will not receive this clasp), and west of a north and south line through Dalmanutha Station, and north of an east and west line through Carolina, the word Carolina being substituted for Dalmanutha Station in the original text. A clasp inscribed "Wittebergen" will be granted to all troops who were inside a line drawn from Harrismith to Bethlehem, thence to Senekal and Clocolan, along the Basuto border, and back to Harrismith, between July 1st and 29th, 1900, both dates inclusive. A clasp inscribed "Defence of Kimberley" will be granted to all troops in the garrison of Kimberley between October 14th, 1899 and February 15th, 1900, both dates inclusive. 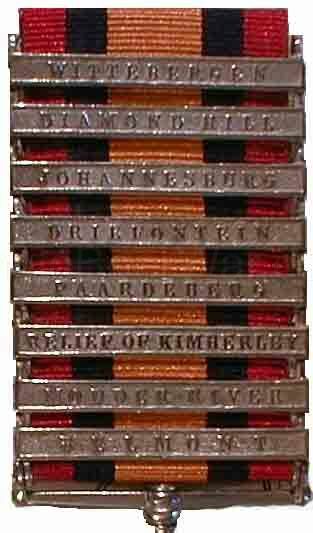 A clasp inscribed "Relief of Kimberley” will be granted to all troops in the relief column under Lieutenant-General French who marched from Klip Drift on February 15th, 1900, and all the 6th Division under Lieutenant-General Kelly-Kenny who were within 7,000 yards of Klip Drift On February 15th,1900. A clasp inscribed "Defence of Mafeking” will be granted to all troops in the garrison of Mafeking between October 13th, 1899 and May 17th, 1900, both days inclusive. A clasp inscribed "Relief of Mafeking" will be granted to all troops under the command of Colonel Mahon, who marched from Barkly West on May 4th, 1900, and all troops who were under Colonel Plumer's command between October 11th, 1899, and May 17th, 1900, both dates inclusive, and who were south of an east and west line drawn through Palachwe. A clasp inscribed "Cape Colony" will be granted to all troops in Cape Colony at any time between October 11th, 1899, and a date to be hereafter fixed, who received no clasp for an action already specified in the Cape Colony nor Natal clasps. A clasp inscribed “Orange Free State” will be granted to all troops in Orange River Colony at any time between February 28th, 1900, and a date to be hereafter fixed, who received no clasp which has been already specified for an action in the Orange River Colony. A clasp inscribed "Transvaal" will be granted to all troops in the Transvaal at any time between May 24th,1900 and a date to be hereafter fixed, who received no clasp for an action in the Transvaal which has already been specified. A clasp inscribed "Rhodesia" will be granted to all troops under the command of Lieutenant-General Sir F. Carrington and Colonel Plumer in Rhodesia, between October 11th, 1899 and May 17th, 1900, both dates inclusive, who received no clasp for the Relief of Mafeking. A clasp inscribed "Talana" will be granted to all troops under Lieutenant-General Sir W. Penn Symon's command on October 20th, 1899, who were north of an east and west line drawn through Waschbank Station. A clasp inscribed "Elandslaagte" will be granted to all troops at Elandslaagte on October 21st, 1899, who were on the right bank of the Sunday River and north of an east and west line through Buys Farm. A clasp inscribed "Defence of Ladysmith" will be granted to all troops in Ladysmith between November 3rd, 1899, and February 28th, 1900, both dates inclusive. A clasp inscribed "Tugela Heights" will be granted to all troops of the Natal Field Force, exclusive of the Ladysmith garrison, employed in the operations north of an east and west line through Chieveley Station between February 14th and 27th, 1900, both dates inclusive. A clasp inscribed "Relief of Ladysmith" will be granted to all troops in Natal north of and including Estcourt between December 15th, 1899, and February 28th, 1900, both dates inclusive. A clasp inscribed "Laing's Nek" will be granted to all troops of the Natal Field Force employed in operations, and north of an east and west line through Newcastle between June 2nd and 9th, 1900, both dates inclusive. A clasp inscribed "Natal" will be granted to all troops in Natal at any time between October 11th, 1899, and June 11th, 1900 both dates inclusive, who receive no clasp for an action in Natal nor the "Cape Colony" clasp as already specified. No individual can have both the defence and relief clasps for either Kimberley, Mafeking, or Ladysmith. The medal in silver, with clasps, will be granted to any native soldiers specially employed within the sphere of operations, who fulfil the necessary conditions. Non-enlisted men of whatever nationality, who drew military pay, will receive bronze medals, without clasps. Army Order 94 also said that anyone who was issued with a clasp for an engagement within a state was not thereafter eligible for the clasp for that state. Thus, for example, no one could gain eligibility to the clasps for both Talana and Natal. The following table shows in which states the engagements took place. The clasps on a QSA are always read from the suspender upwards. The list below shows the clasps in the order of wearing, with the clasps at the bottom of the list appearing closest to the suspender.